However, there is a subtle distinction. All observations or analysis in the examples above are from the outside – they are not the actual thought process of a decision maker, that moronic CEO. The commentators did not have any insight into why the captain and coach decide to not play that particular player. They were simply positing based on what everyone can see and pumping it through their rationalization process. That is subtle – but an important distinction. Complex decisions (as most decisions are) will always have stuff that everyone knows. Public information. Annual reports. Known facts. Obvious behaviors. Past statements. Historical data. Everyone can dissect them to come up with their own versions of a decision. But – and it is an important but – there is always more to than what is obvious and readily available. Information that is not public, insights and data which only the decision maker has, strategy and intent which only few know, the insider information that only comes through covert channels. There may be head fakes. And then there is this seemingly irrelevant component which is experience and wisdom of the decision maker that the ordinary onlooker does not care about (remember you think they are all morons). There is that long-term internal plan where the acquisition fits in; the financial blunder from the fired CEO that only the board knows about; a wealth of data covertly collected by HR of slacking from home rather than working from home; internally recorded evidence of the bypassed person of withering under pressure that never got the public eye; the insights that the upcoming competitor product is much better than the retiring product and the captain and coach both know that the dropped player is suffering from exhaustion and fatigue and is not mentally up for the match. It’s not that there are no stupid decisions. There are, and plenty of them. There is no reason to believe that all decisions that do not make sense on the face of it are right. There are dumb people making even dumber decisions everyday. But in most cases, the wrong decisions are probably wrong because of the decision makers not seeking, willfully ignoring, misinterpreting or diminishing the value of any internally available data and insights – the non-public stuff. Most can do the maths of the known facts and historical data. They are even not as complex as the insights and internal data, which may be subjective too. To make it worse, complex decisions are typically not black and white. There is no one right decision. They are always based on what is known today and making a best judgement. Hindsight is always 20/20 but foresight has no such privilege. There could have been that other company whose acquisition would have made good sense too. The product may have been retained and improved rather than retired. Pumping up that mentally fatigued player for a crucial match may have brought the best out of him. There will always be ifs and buts. Those making complex decisions are humans. They need to be given the benefit of being human. Decision making is tough. It’s subjective. It’s brutal. It has trade-offs. It can never satisfy everyone. Decisions that make sense to everyone are generally the easier ones (or stupid ones). As Drucker said, most decisions are at best “almost right” or “probably wrong”. This entry was posted in Communication, Management and tagged Decision, Executive. Bookmark the permalink. Yes, no one is perfect and do bad and good decisions… However can point ourselves towards the perfectness by learning and correcting previous mistakes.. (If these are not so horrible.. :p ). b. Going against their value (e.g. they wouldn’t buy dell for precisely the opposite reasons). What you state are all facts, but as I mention, there may be more facts lurking around under the cover. Not to mention not every deal is done to make a profit – atleast not directly. As someone said: “facts are only part of the truth”. very well written. I would like to add couple of comments to it. There is an old legal saying that ” Not only justice be done but it should be seen to be done”. I always like to point out ladder of inference for decision makers; There is a data, then rules/predicates that we apply on the data and get a decision as a result. If decision makers make their rules clear, and then once they provide the data set, all rational beings should be able to get to the final decision. I think this is also very important in consensus building. we can use it on simple acts such as picking or dropping of a layer in a match; it can be used for really complex issues such as negotiations with Taliban. GE/Mckinsey matrix, Boston consulting’s growth/marketshare matrix are such predicates that allow transparency into the decision making process. Thanks Azhar. 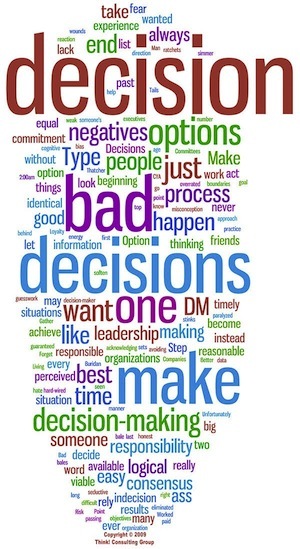 I agree that the decision making process needs to be made visible, quantified and streamlined as much as possible. That ensures that the process is transparent and more importantly, as accurate as possible. However, I also think, that all complex decisions are subjective to some extent also, something which may not be completely captured in a quantified tool. We just need to be mindful to not over-formalize the process. Thanks for sharing the tools!